Slice the green tops from the strawberries. Slice a small portion from the bottom of each strawberry, so the stand up straight. With a paper towel, gently dry off the top of each fresh-sliced strawberry. Place strawberries on serving platter. Using a mixer, beat together banana, cream cheese, honey, lemon juice, and vanilla until light and fluffy. Beat in stevia until the mixture is preferred sweetness. Either spoon banana mixture into an icing bag fitted with a large star tip. Pipe onto the top of each prepared strawberry, or add banana mixture to a gallon size ziplock bag and snip off about 1/2-inch on one of the bottom corners, or simply spoon mixture into each strawberry. In a small bowl, stir together crushed almonds, coconut sugar, and cinnamon. 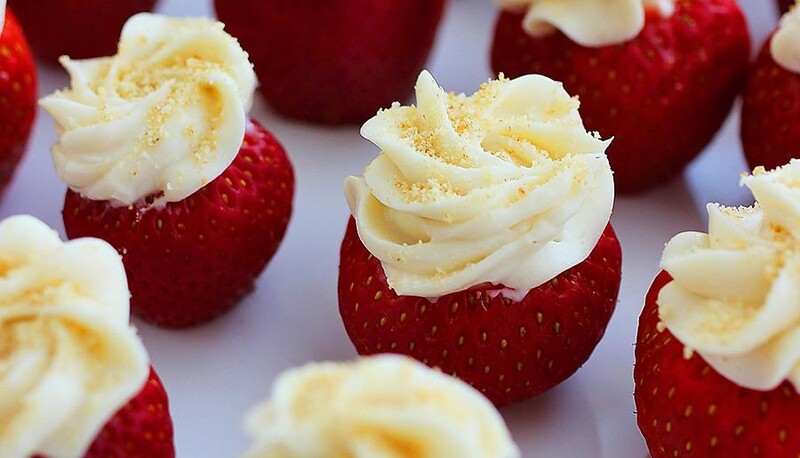 Sprinkle on top of strawberries.